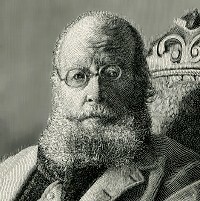 Edward Lear (12 May 1812 – 29 January 1888) was an English artist, illustrator and writer known for his nonsensical poetry and his limericks, a form which he popularised. Have all built their nests in my beard!" Book of Nonsense, Limerick 1 (1846). How pleasant to know Mr. Lear! Who has written such volumes of stuff! But a few think him pleasant enough. How Pleasant to Know Mr. Lear, st. 1 (1871). His beard it resembles a wig. How Pleasant to Know Mr. Lear, st. 2. "The Jumblies", st. 1, in Nonsense Songs, Stories, Botany, and Alphabets (1871). In spite of all their friends could say. And they never came back to me! Calico Pie, st. 1 (1871). But he never came back to me! Is the Akond of Swat? The Akond of Swat, l. 1 (1877). The Quangle Wangle's Hat, st. 1 (1877). The Dong with the Luminous Nose, st. 1 (1877). He replied, — "Fish fiddle de-dee!" The Pobble Who Has No Toes, st. 1 (1877). That Pebbles are happier without their toes. The Pobble Who Has No Toes, st. 6. We think so then, and we thought so still! The Pelican Chorus, chorus (1877). Incidents in the Life of my Uncle Arly, st. 7 (1895). To the land where the bong-tree grows. These were all his worldly goods. Sits the Lady Jingly Jones! I would be your wife most gladly! But in England I've a mate! For in England I've a mate. This page was last edited on 12 May 2018, at 15:43.